Irish Socksciety supply the people and businesses of Galway with the most colourful and quirky socks imaginable, but you already knew that, didn’t you? We caught up with Joanna, one half of the team, to talk about their brand’s identity, spanning from sustainability to brand awareness. Joanna and I dodged raindrops and splashed through puddles on our way to Kai, the home of their very first customised sock. Since it’s Daffodil Day, Joanna has donned a pair of their Irish Cancer Society socks. Genuine passion and love for their work shines out of her face as she describes their journey from selling souvenirs to seeing their designs all around the country. Joanna and Alex, her business partner, are sole sisters. 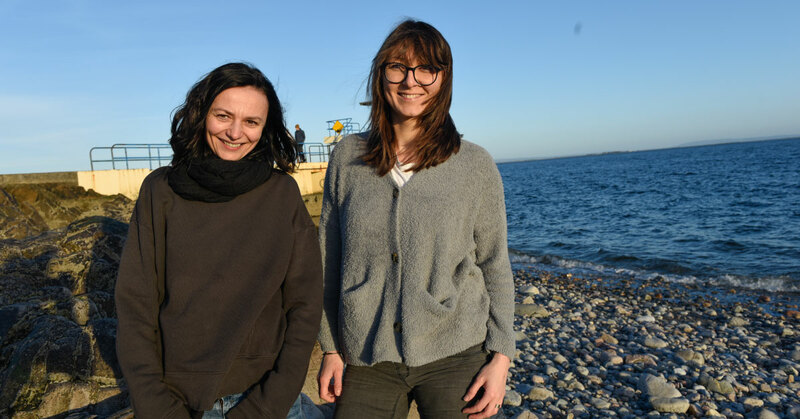 They were neighbours back home in Poland but by some twist of fate they didn’t cross paths until they came to Galway. 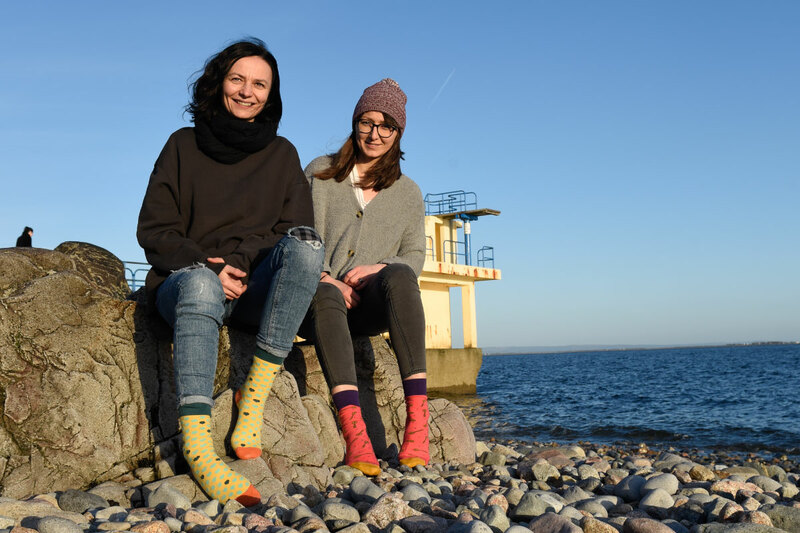 Way back in 2011 the duo started their initial business selling Irish souvenirs to tourists, a concept which has been evolved and remoulded into the form of Irish Socksciety. “We have a genuine passion for Ireland and the business was born out of that love. We’ve had really tough times and we’ve had really good times, but it’s the sense of humour and the Irish kindness that have kept us going”. Each design celebrates a different element of what it is to be in Ireland, and our humour is unique as feck. From the changeable weather and music sessions to leaving the immersion on and mammy’s dreaded wooden spoon, they encapsulate the craic of the country like no other. For Joanne, their line of work is very joyful; “people laugh when they see the socks. We’re selling something people understand. They know how to wear them, and they know how to wash them. We don’t need to explain anything”. Countless businesses around Galway have benefitted from Irish Socksciety’s custom designs. Once Kai got their very own design, word spread like wild fire through the restaurants, cafes, bookshops, and even windmill companies of the country. “It’s a lovely gift. It’s not heavy, it won’t break and if you only have hand luggage it’s so easy. It brings the brand of these businesses somewhere else”. Take Walsh Waste for example, a waste management and recycling company out in Oranmore got their designs with “What a load of rubbish!” written across the soles. It lends each company a quirky and unique edge. Everything about these designs is personal, right down to the illustrations on the labels. Irish Socksciety strive to produce an ethical and sustainable product. “We put a lot of effort into our packaging to ensure it’s recyclable. Sustainability was always very important to us, so we do our best to be as eco-friendly as possible”. The brand also promote sustainability across all their social media platforms, encouraging people to give up plastic for Lent. Sure why would you be giving up chocolate when you could be saving the planet? for them – is the craic. “It’s a product that sells identity, whether it’s a brand identity or the Irish identity. We incorporate the humour so that if you’re living in Australia and get socks saying, ‘did you turn off the immersion?’ you will laugh”. Their customisable subscriptions allow you to select dates to have socks sent out on, sorting all your gift giving for the year. So you have no excuse for forgetting your dad’s birthday, Christmas or Father’s Day presents. Down the line Joanna and Alex hope to introduce more designs and new products as well as promoting more Irish artists through their socks, following the success of their collaboration with Shane O’Malley. For now, the duo describe themselves as “two happy little dogs, wagging their tails”. They are doing what they love and sharing that love through their product. 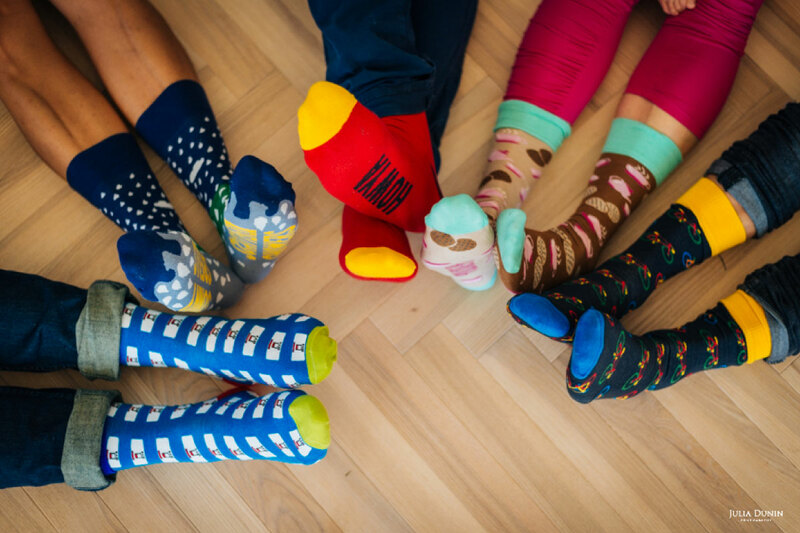 Irish Socksciety provide a fun and practical gift. They give brands a whole new level of awareness while being environmentally conscious. Above all, the brand is filled with laughter and that good old-fashioned Irish craic. When you make a purchase from Irish Socksciety, you’re buying so much more than just a pair of socks. You’re buying a memory, a story, a piece of history. You’re buying something that will give you a giggle when you put your feet up at the end of a long day. You start your day off by shticking your feet into a pair of socks, so why not start the day with a laugh?